So this is Eryn Cochwyn now? Why does she look so familiar? She's not in the Congress of the Keys, but haven't we seen her before? It's interesting that she didn't get some text that says she counts as Eryn Cochwym, so you can actually have two versions of the same unique person in play at the same time with this card. 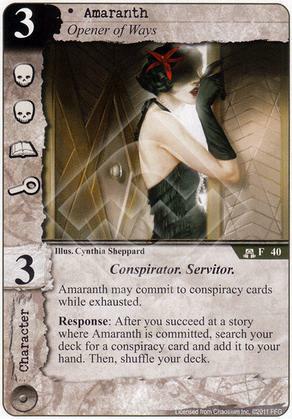 The only thing I don't like about Amaranth is your opponent gets a whole turn in between seeing your fetched conspiracy and that conspiracy actually hitting the table. It's basically announcing the conspiracy that's coming. That's why I've recently switched to The Red-gloved Man. You keep the surprise factor intact. Since they are both unique and valuable for tutoring, I generally include a copy of each whenever I include a copy of one. They're sort of a "couple" for me. I'd mostly use her for her passive ability/icons because her fetching ability can be pretty unreliable (unlike the Red Gloved Man's). That aside: It can still be useful to filter your deck if there's a conspiracy on board already. Side note: one of my favorite artworks in the game. It's almost a pity that she's a neutral card because some more contrast to the colors in the art would have been nice.